Dante Lauretta, a professor of planetary science and cosmochemistry at the UA Lunar and Planetary Lab, is the principal investigator for the OSIRIS-REx mission, which is nearly in orbit around the asteroid Bennu some two years after its launch from Cape Canaveral. He spoke to the Tucson Weekly about how it feels to be nearing a long-time goal. How did it feel to see that first image of Bennu? It was indescribable, really. It was a moment I couldn't wait for. I was in Japan, participating in a site-selection meeting for their Hayabusa 2 asteroid sample return. So the first image reached me about 2 a.m. local time. I thought I'd be able to go to sleep and set an alarm and wake up to see it, but I couldn't. I just laid there all night long, checking my e-mail every five minutes until the image showed up, and then stayed up until 4:30 when the team gathered and congratulated everybody and celebrated with them. You launched OSIRIS-REx about two years ago. Talk a little bit about what you're hoping to learn about on this mission. OSIRIS-REx is an asteroid sample return mission, so our primary objective is to bring back pristine, carbon-rich material from the asteroid surface. And we believe this asteroid dates from the very dawn of our solar system, and records the molecular evolution of organic molecules. We're hoping to gain insight into whether these kinds of asteroids delivered the building blocks of life to Earth, and maybe even the water that made our oceans and made our planet habitable. OSIRIS-REx is scheduled to arrive at Bennu in the coming months. What happens then? So right now we're in the approach phase for OSIRIS-REx. That began on Aug. 17 when we acquired those first images. We'll spend the next several months periodically targeting the asteroid, surveying the operational environment, getting a first look at its chemistry and mineralogy, and ultimately starting to resolve the asteroid and determining its shape. On Dec. 3, we'll fire the rocket engines on the spacecraft and we'll be targeting a fly-over of the north pole of the asteroid. That'll be followed by a series of additional fly-overs, including the equator and the south pole. And the key objective during that preliminary survey phase is to measure the mass of the asteroid, and to get our first high-resolution images of the asteroid surface. And we're going to use that information to design an orbital insertion, and that'll happen right around New Year's Eve in 2018. So by the beginning of next year, we should be orbiting the asteroid and really setting ourselves up for the detailed scientific mapping campaign. You are the Principal Investigator on this mission. What does that title mean, and how is UA Lunar and Planetary Lab involved with this mission? As the Principal Investigator for OSIRIS-REx, I'm responsible for overall mission success to NASA. 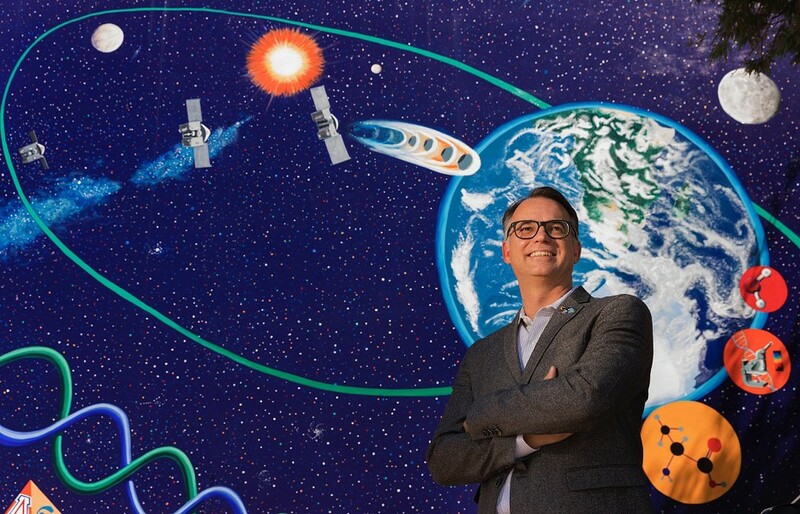 The University of Arizona holds a contract with the space agency. We have promised to lead this mission, to defend its scientific integrity, and to manage the resources, to make sure we stay within our budget and our schedule constraints. So at the end of the day, I'm the person responsible for making sure OSIRIS-REx gets its job done. Who else is part of this team? Here at the University of Arizona, we have almost 70 team members based at the Michael J. Drake building. Our other team members include the NASA Goddard Space Flight Center in Greenbelt, Maryland, and Lockheed Martin Space in Littleton, Colorado. We have hardware provided by Arizona State University, by the Canadian Space Agency, by Goddard Space Flight Center and by the Massachusetts Institute of Technology in partnership with Harvard. We have team members that are spread all over the country at various universities and from many countries, including France, Japan, the United Kingdom, Italy, Spain, Czech Republic and others. You're also looking into this Yarkovsky Effect. What is that all about? The Yarkovsky Effect is a non-gravitational force that can change the orbit of the asteroid. We know Bennu has a very dark surface, and that's one of the key pieces of evidence to make us think it has a lot of carbon, and why we've targeted it for sample return. But as a result of that really dark surface, when the sunlight hits it, most of that energy is absorbed. So you can think about a parking lot in Tucson in July. You go out at night, and you can still feel that heat radiating off the surface from all of the sun's energy that was absorbed over the course of the day. On Earth it doesn't really change things, but on a small asteroid like Bennu—you've got to remember the asteroid is 500 meters in diameter—that emission of heat actually thrusts the asteroid, resulting in a change in its orbit, and therefore its likelihood that that orbit is going to intercept the Earth and cause an impactive action. Is the Earth in any danger from Bennu? Bennu is considered a potentially hazardous asteroid. It has a one in 2,700 chance of impacting the earth, which are pretty small odds but they're significant. It's something that we need to pay attention to. The good news is that the impact is not going to occur until well into the 22nd century, though part of the OSIRIS-REx mission is to really understand its future orbit and further refine that impact probability, and gather the information about the object's size, shape, rotation, orbit, composition, mass, so that anybody who needed to design a deflection mission would be well-equipped to undertake that task. This mission is part of NASA's New Frontiers Program. What is New Frontiers all about? New Frontiers is a series of missions in NASA's Planetary Science Division. It's a large class of missions with budgets on the order of a billion dollars. We are the third mission in the New Frontiers Program, the first being the New Horizon Spacecraft, which did a successful fly-by of Pluto, and it's on its way to encounter the first Kuiper belt object. The second one is Juno, which is an orbiter around Jupiter, and it's studying the internal structure and the radiation environment and the atmospheric processes of that giant planet. Third is OSIRIS-REx. From time to time, I hear complaints that we aren't doing enough manned space missions these days. Talk a little about the advantage of sending out a robot like OSIRIS-REx. Sure, and I believe the term these days is "crewed missions." That's the official NASA terminology because there's lots of gender diversity in the astronaut corps. But the robotic missions, they kind of go hand-in-hand with human exploration. There's a lot of targets out there that are impossible for humans to reach at this point in time, including something like asteroid Bennu. We're a seven-year journey from launch to Earth return, and we are not equipped to send humans into outer space for that duration. Also, you know, even with missions to the moon or to the surface of Mars, which are viable human destinations, the robotic spacecraft are required to survey that area, to develop resources that would be used by people that would be landing in those environments, and also to really push the boundaries of human knowledge to places like the deep solar system. We won't see humans going for many, many decades in the future.